Even a well designed garden can become tired and frayed at the edges as plants get leggy or do better than expected in a particular spot. We replanted the beds, shaped and sculptured 5 large Pittisporum trees and tried to link the magnificent Magnolia that stands in the middle of the lawn with the rest of the garden by planting the 2 Pittisporum ball shaped plants- Pittisporum Tom Thumb and Pittisporum Golf Ball. These plants will become beautifully round and look as if a giant has scattered its marbles on the lawn. 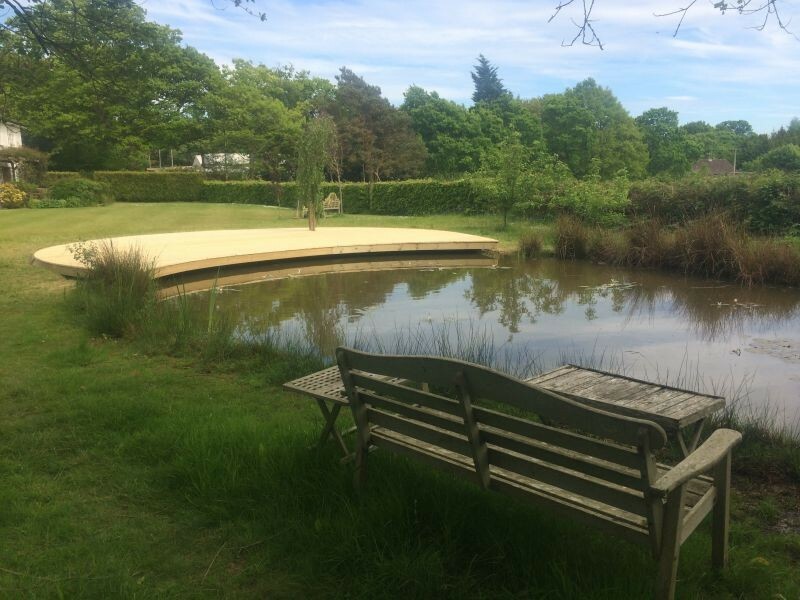 This pond in East Sussex had such a lovely curve at the approach end from the house that I decided to extend the design of the new decking over the pond and follow the curve for one end to the other. Once the wood silvers in colour it will look like it has always been there. 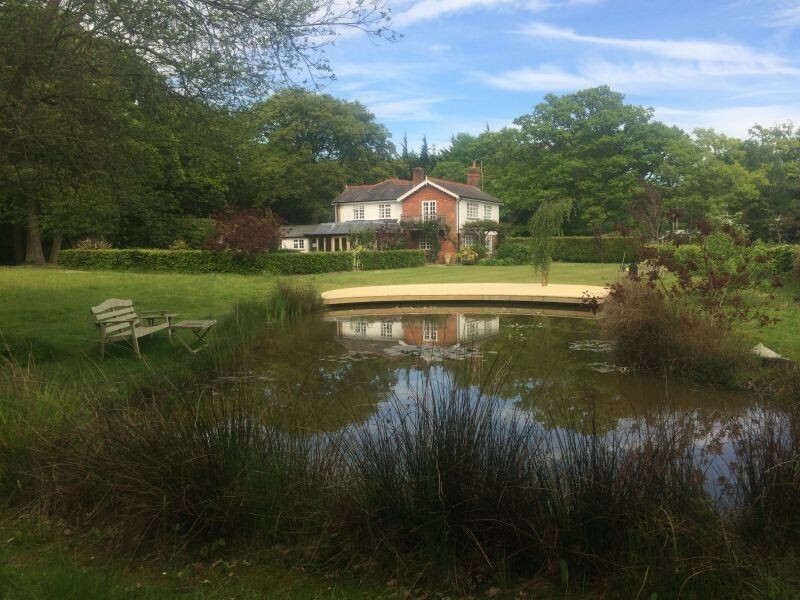 Large sways of ornamental grasses and perennial plants will link up the pond to the house and create a real journey from the courtyard garden of the back of the house to the pond, whereas at the moment thee is just lawn. Paradoxically a large lawn can make a garden feel limited in size whereas curved borders full of rich planting, variation in heights and divided up spaces can evoke mystery and on going exploration. This slows down time, whereas an expanse of lawn can limit oneself to the time it takes to mow it! On the steps we used a bespoke ornamental tile and the Olives are underplanted with Allium Purple Sensations, Libertia peregrinas, Geranium White-ness, Verbena bonsariensis and Gaura. This underplanting will take over from the Alliums to provide lasting summer and Winter interest. 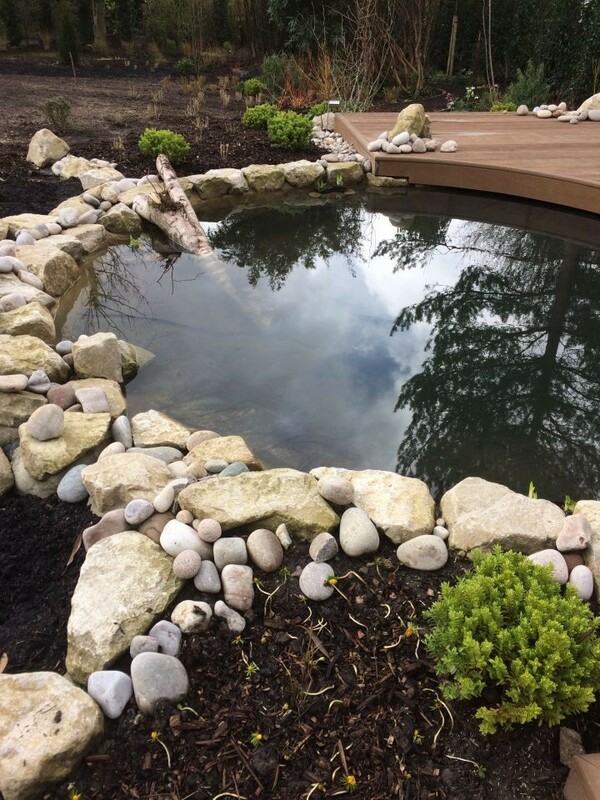 This garden design, which we implemented this February, aims at creating what you might find in an hour walking in the countryside, into a single space. 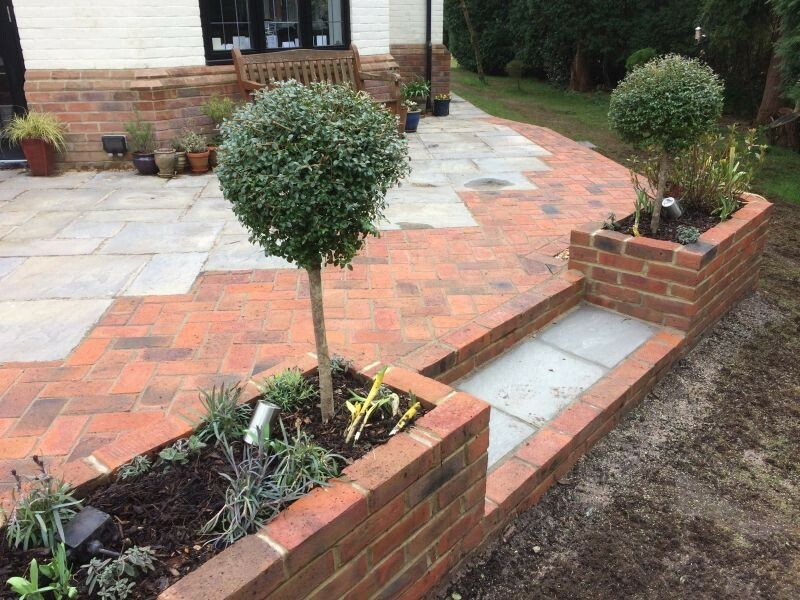 We extended the patio and made new brick planters with more formal planting. 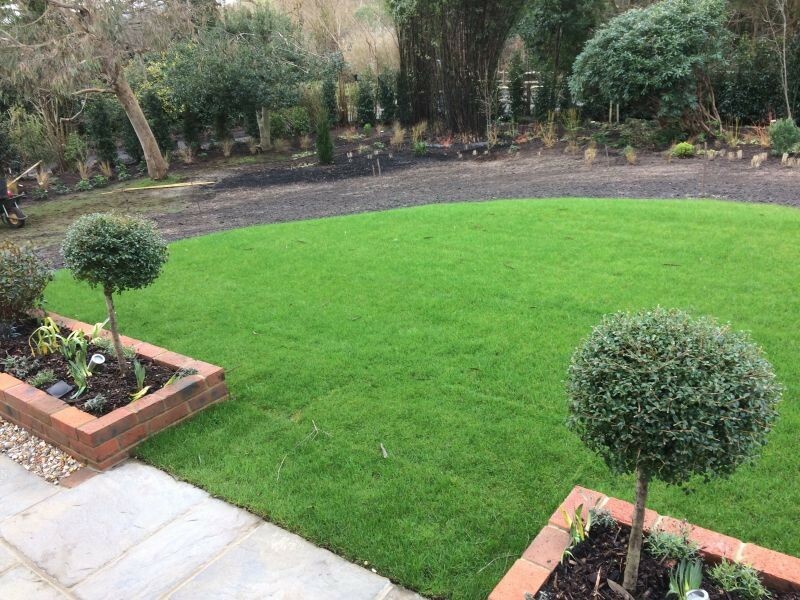 We created a formal lawn from high quality turf and in the remainer of the large lawn area we seeded with acid perennial wildflowers and an annual cornflower mix. This wildflower meadow will flow down the garden and on the right hand side reach a new wildlife pond. Behind the pond we planted the dark green Portuguese Laurel to v=create an atmospheric grove with Spiribolos grass in front of that that will empty in frothy plumes over the decking at the back. Paths will be created though the wildflowers with a lawn mower during the year. From the pond a bark chip path flows into a newly planted woodland area. We planted thousands of Bluebells, Snowdrops and Aconites which will come into their own next Spring. 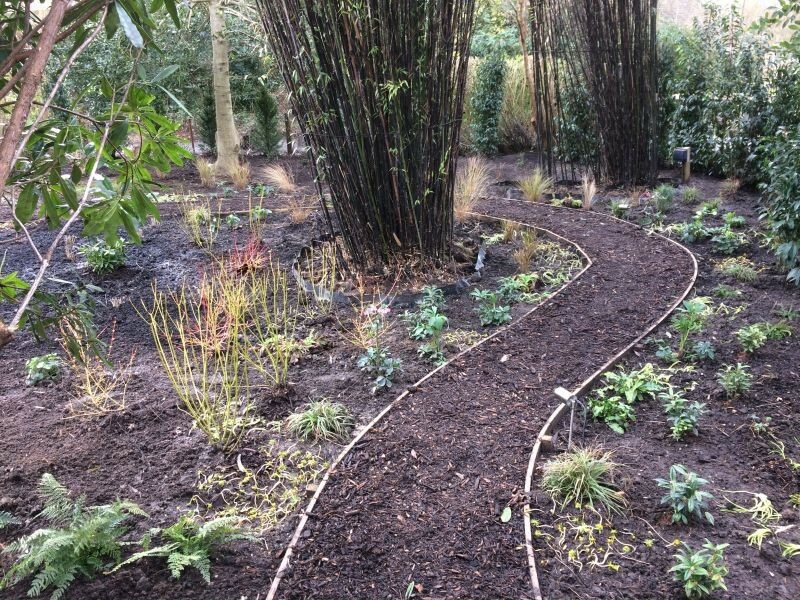 Around the Black Bamboo we dug in a root barrier membrane and used a delicate black rope to tidy up the branches which tended to spread out all over the space. In summary the design blends in formal, wildflower, contemporary decking and traditional woodland. We especially used different styles of planting, and plants that would transition from one style to the next, the unify the whole composition. In my last blog I gave some background to Great Dixter. One striking element to the gardens is both the house and strong, dark greens of the Yew topiary. They provide a strong tonal background to the frothier temporal planting of perennials and annuals. This garden is also well known for its use of rare plants and unusual combinations. They beds are saturated in planting detail and even though the gardens are not big one can spend hours there immersed in each 'garden room'.